If your little one like playing with cars and trucks and also they spend hours on stacking games and puzzles, Then they will love this 2-in-one truck and cars set by Vilac! The truck (with trailer) and the cars can be driven around separately, and they when they're done, the smaller vehicles stack on the trailer! Stacking helps to develop hand-eye coordination and emerging fine motor skills, as children (aged 2+) learn which ways the six cars fit together. 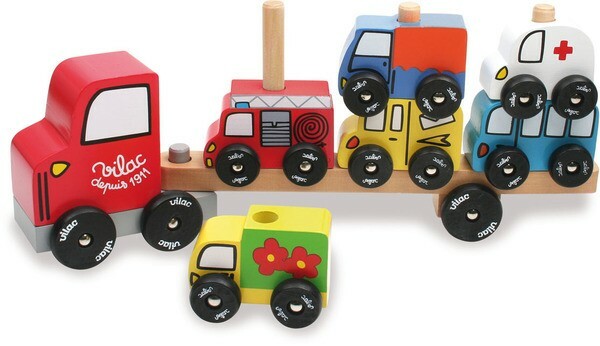 From learning to count to familiarising themselves with colours, this Truck and Trailer with Cars Stacking Game would make a wonderful addition to any playroom. Beautiful wooden construction. Set includes truck, trailer and six stacking cars. Brightly coloured and engaging for attracting little hands!